A glimse of the vision for Basingstoke of the future. Excited? 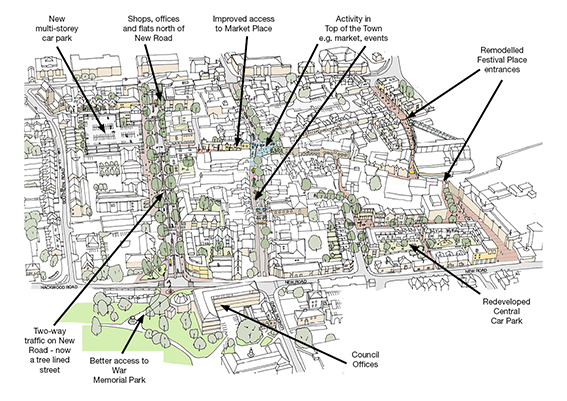 A new ‘master plan’ for the central area of Basingstoke – known as The Top of Town, which includes the pedestrianised High Street – was published on 31 January 2014 along with a public survey (that closed 7 March 2014). 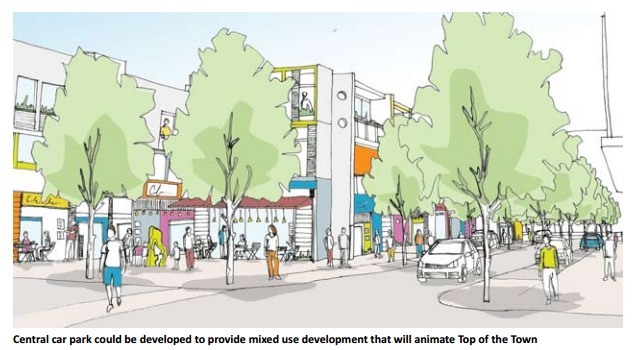 The plan highlights the construction of a new 5-storey car park along with a few more ditties – like a redeveloped central car park – to keep you happy if you choose to drive your car around Basingstoke’s central area. But what if you want to choose a different way of getting around town? says nothing about permitting cycling across the top of town (eg to access the shops and the council offices). There are already some good walking and cycling facilities near the town centre (and a coffee shop that welcomes people riding bicycles through their drive thru! ); but this plan fails to leverage them – and create more – to the benefit of the businesses and the town’s people as a whole. Two car parks dominate the actions to change Basingstoke. Seriously. Instead of actions, the master plan relegates walking and cycling to mere ‘Vision’. The focus stays firmly on “easy” car access – much like “smoothing traffic flow” and the reduction of crossing times across busy roads seen in London (to say nothing of dangerous buses there). In Basingstoke, there’s hamburger junctions on the menu! Basingstoke is an ideal sized town for cycling, but offers poor facilities. The existing cycle route network is fragmented and there is a lack of dedicated cycle facilities on main routes. The large-scale junctions across the town discourage cycling. Cycling is prohibited on pedestrianised streets in Top of the Town (with a max £500 fine) and there is limited cycle parking facilities. Basingstoke & Deane Borough Council (B&DBC) have a long history of this kind of planning, especially in Basingstoke. Before this Master Plan, there was “Basingstoke Vision” in 2007; and “Basingstoke Central Area” in 2003. In short, the council have years of experience of writing plans, reports and press releases whilst doing little to counter the dominance of the car as a transport choice. The proposed new 5-storey car park would “animate” the Top of Town, say the consultants. It is right that people who choose to drive cars are considered – of course, this is the reality of today’s Basingstoke – but there must be an increased commitment IMMEDIATELY to create space for cycling and walking, in order to build a better Basingstoke. Government has recognised the evidence that pedestrians, cycle and public transport users provide as much if not more spending power than car users in town centres. Studies in Germany and the UK have shown that pedestrianised areas have the potential to bring about an increase in footfall for retail services of between +20% to +40%. This is then reflected in increased property rental value. there appears to be consistent misinterpretation by traders that the majority of their customers arrive by car. The only picture in the Master Plan that shows people using bicycles is this one – and these women are not even riding them! CONTRARY TO ITS OWN POLICIES? Deliver a new Green Business Park at Basing View, setting the examples for local business. So how does this line up with what is actually to be implemented in Basingstoke given this latest master plan? In short, it appears not to. When the final version of the Concept Masterplan is approved, we will then be working on specific actions to bring each objective into reality over a period of time. Taken at face value, there is an opportunity now to influence what it means to turn each objective into reality: Fill in the survey and email the project manager. Together, let’s focus the minds of this blurry vision’s authors to pedal something other than the same-old-same-old. 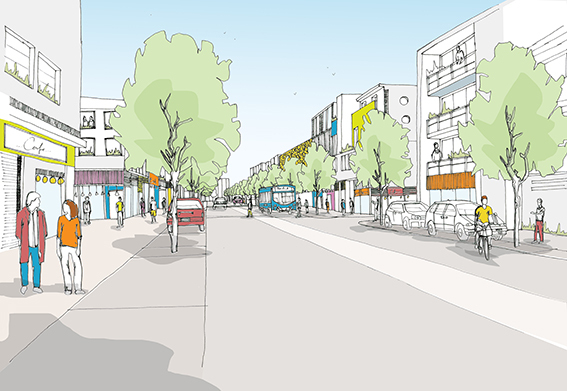 The Basingstoke master plan was created by Hugo Nowell of Urban Initiatives Studio Ltd for the Basingstoke & Deane Borough Council, following their appointment of Chas Bradfield as Basingstoke Town Centre Project Manager with over £250,000 to spend. (in contrast, the so-called car-centric “hamburger” junction for Basingstoke is slated to cost – sorry, be an “investment” of – £4.3million). Statistics show that there are about 3 people killed or seriously injuried each year in Basingstoke whilst cycling (in 2011 there were 6). Instead of encouraging cycling, the ‘spatial plan’ recommends the opening up some routes to allow more access to people who choose to drive their cars (item 4 page 49) and classifies car parking as “essential” to the shops and businesses (p51) which leads to the recommendation of creating a 5 storey car park with 470 spaces for cars (p51); with on-street parking remaining in some streets too (p51). The comparison to Ashford Ring Road (p55) shows “shared space” as being the vision there – namely that people who walk and cycle will have to contend with people who choose to drive their heavy (and sometimes dangerous) vehicles — people often cite fear of traffic as a reason for not cycling. Shared space is not the way forward. The drawings and pictures in the ‘vision’ section are hardly inspiring either for people who had hoped to see cycling given more prominence – there’s a picture of 2 women pushing, not riding!, their bicycles and a drawing of a person on a bicycle doing battle with a motor-vehicle dominated landscape. f) Early Win Projects – Provision of more cycle parking at points of arrival into the town. You make many good points – but many cyclists in the Top of the Town pedestrian area are dangerous. How can they be directed to use the “shared space” better?